In recent weeks across campus, Vector Marketing (VM) job flyers have been pinned in several NEIU locations such as Lech Walesa Hall (LWH), the Fine Arts Building (FA) and even in bathrooms. The flyers state the job pays $17 base/appt (appointment), offers a flexible schedule, among other benefits, with no experience needed. 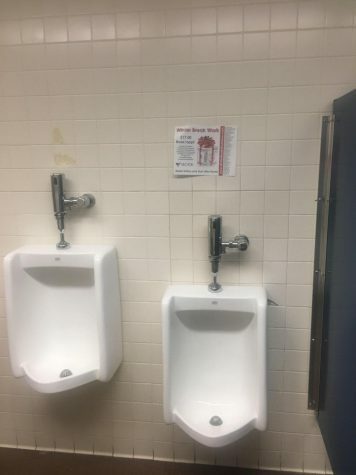 Photo of Vector Marketing flyer found above a urinal. 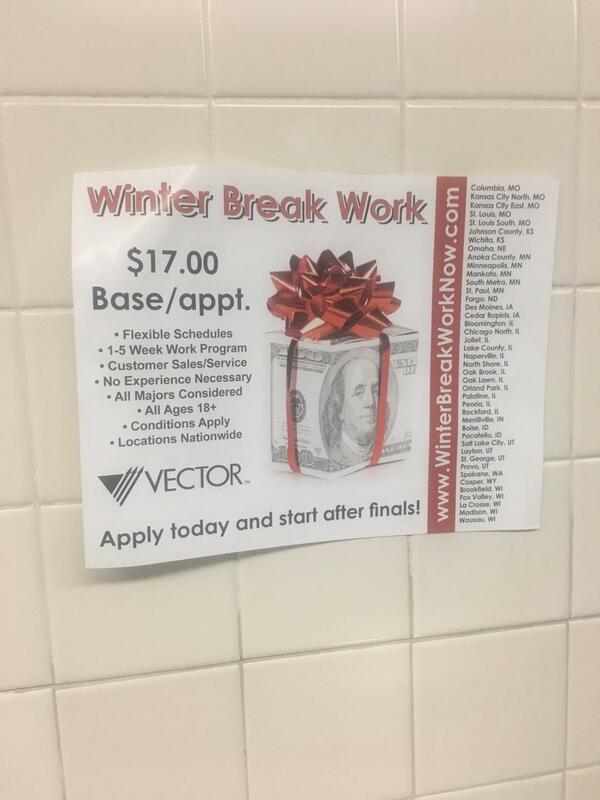 As of Nov. 26th, the website from the VM flyers, WinterBreakWorkNow.com, was an application, first requesting a zip code, name, email, phone number and which of the following age groups you fit into: 18 years old; 17 years old in high school (graduating in 2018); or none of the above. On Nov. 28, Wilde and Lewis were at NEIU’s Student Union sitting at the VM informational table. When pressed for more information about VM, Lewis told the Independent he would send over the information for VM’s Campus Relations Team (CRT) at a later time; however, he did not send any information along. The VM website didn’t offer any information about the CRT and Lewis became difficult to get into contact with. NEIU’s Student Union and Career Services Department have both stated their policies do not allow outside companies to freely post flyers. Director of Career Services Kris Pierre said because NEIU is a public university, NEIU has to “provide access,” meaning VM can vend and occupy Student Union spaces as long as they pay the $75 vendor table fee to Student Union. Pierre later stated there are students who have expressed concerns over VM. Director of Student Union, Kyle Burke, stated there are terms and conditions that businesses must comply with when vending in Student Union. Brian Langenberg’s tips on finding out if a MLM is worth it. VM doesn’t help any of their employees find clients and when asked if Fischer had any repeat clients, he said no; his new clients would generally come from referrals, and if they were clients he had before, they were requesting him to come sharpen their knives. Fischer said he “never paid attention” if VM was a legitimate MLM or not because his goal while working at VM was to make money. It took two weeks for Lewis to provide the information for VM’s CRT, but said he would only connect the Independent with the CRT if it was a three-way call between involving him, the CRT and the Independent. A three-way call was scheduled for Dec. 17 but after several attempts to contact Lewis, the three-way call didn’t happen. Two days later on Dec. 19, the Independent reached out to VM’s Northshore Branch’s Pilot Sales Manager, Abiola Adun, who told the Independent he would call back after their VM holiday finished at 9 p.m.. Adun did not call back or pick up any attempts to contact him. After further searching, the CRT did end up having a website: www.campusrelations.com. The Independent contacted VM’s CRT and was put in touch with Campus Recruiting Manager, Amanda Sahawneh, located in Arizona.